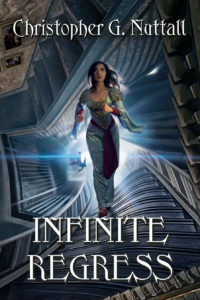 In Infinite Regress, the ninth Schooled In Magic book by Christopher G. Nuttall, Emily returns to her beloved magic school, Whitehall, only to be confronted with devastating news. The old headmaster knew Emily’s secrets and supported her, however, he died during the previous term saving the school from a demon. The new headmaster does not know Emily. Worse, he neither likes no trusts her. He blames many of the recent disasters the school has suffered on this strange and troubling student. When others object, he tempers his judgment. Emily may come back to school, but now she is on probation. Should the slightest thing go wrong, she will be out on her behind. Emily loves Whitehall and agrees to work as hard as she can. In addition to her studies, her growing relationship with boyfriend Caleb, and a new mentoring program that requires her to help younger students, she and another probational student, Cabiria , are assigned to help old Professor Locke explore the previously-sealed corridors below the school. Only it seems those corridors were locked for a reason. Whitehall is a magical building that can redesign itself, with halls and staircases occasionally moving position. Apparently, the controls for this system are hidden under the school, and when Professor Locke touches them—they begin to go haywire. Suddenly, everything is changing. Doors are vanishing; walls are closing in; students are falling through what was previously floors, and, worse, no one can find the way out of the school. Will the food last until Emily can put things right? Will she lose any of the younger students under her care in the ever changing labyrinth of the school? And what is at the heart of Whitehall Academy? Infinite Regress and Past Tense, the book that follows, are among my favorites in the series. I really like the stories that take place at Whitehall, and this one has the even more wonderful quality that the problem is, finally, not Emily’s fault! That is worth celebrating right there! There were some parts that were almost too frightening for me. When the building went mad, and it looked as if young students, including Emily’s friend Frieda, might be lost or killed—that was very distressing. I imagine being caught in an earthquake might feel a bit like that. However, those sections were short, in the grand scheme of things, and certainly added to the overall, quickly growing stakes. I enjoyed watching Emily solve the mystery of who was tormenting the ugly student under her care, as well as the intriguing expedition into the bowels of the magic school. Plus there were some strange events in which someone seemed to be framing Emily for the theft of a library of old scrolls. All these elements made for a very entertaining tale! Though I should warn you, dear reader, that Infinite Regress is part one of a two-parter! The story concludes in part two, Past Tense. 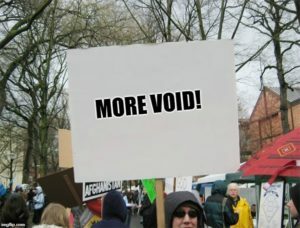 There is not a single appearance by Void.